Let’s see what the week of 15 February brought us. 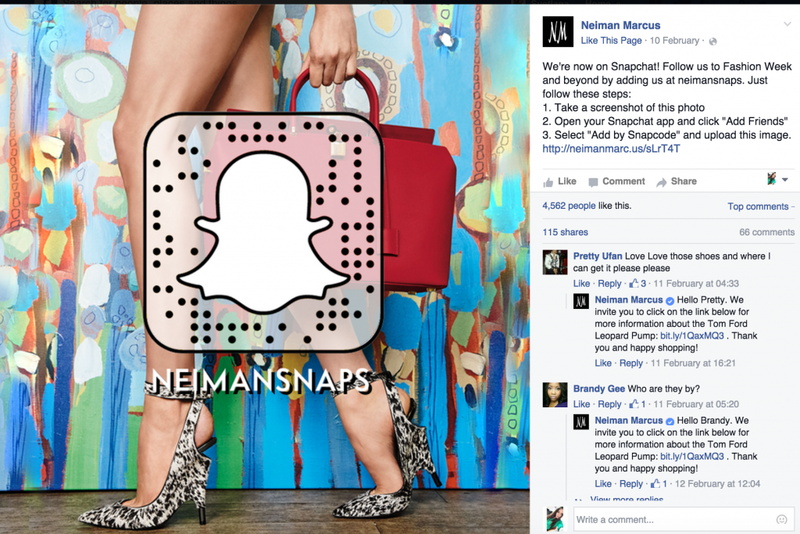 The enormous success of Zeeman Trouwjurkcampagne, G-Star Raw and their old friend, but new co-owner and Neiman Marcus is actively using the latest tools generating high engagement. Zeeman has significant increase on % PTAT last week 988,02%, followed by G-Star Raw with 187,90% and Neiman Marcus 173,84%. 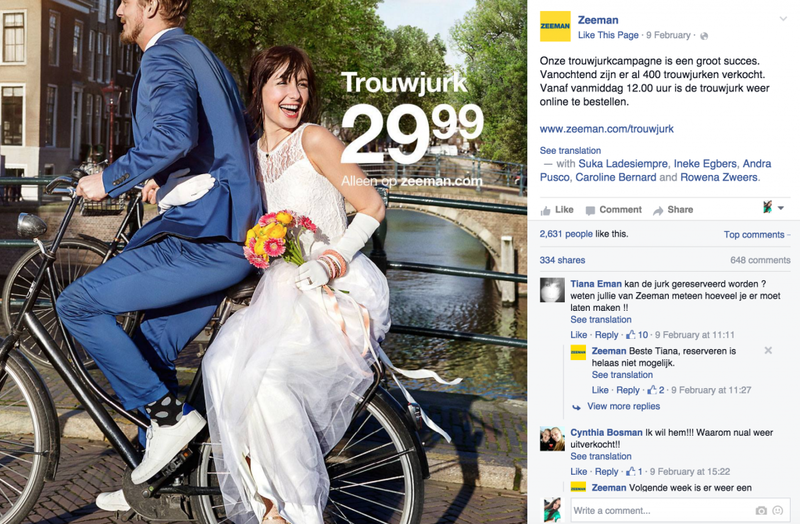 How come, that Zeeman increased their engagement up to 988.02%? Their “Trouwjurkcampagne” brings them enormous success. Zeeman presents a wedding dress for only 29,99 euro and changes stereotypes that wedding is always about big expenditures, making it available even to people, who can not afford Vera Wang. Zeeman is doing a very good job, satisfying a lot of women’s desire to look beautiful in the most important day of their life and saving some money in their men’s pockets. What the most important they do it first among the other brands offering wedding dress for so low price. To be creative is important, but what’s more important be first! 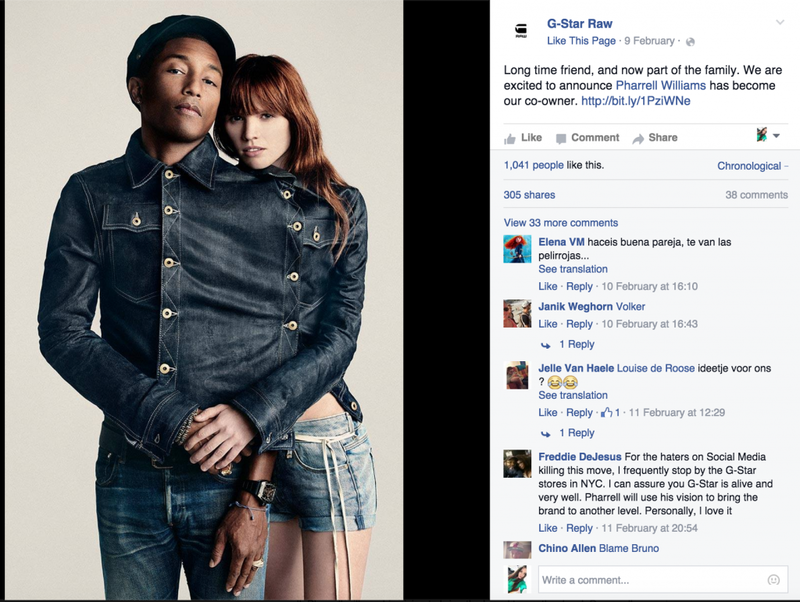 G-star is raising their engagement with the help of Pharrell Williams. A lot of work together and long cooperation lead to Mr.Williams becomes a co-owner of G-Star Raw. Neiman Marcus is the third this week with 173,84% PTAT. 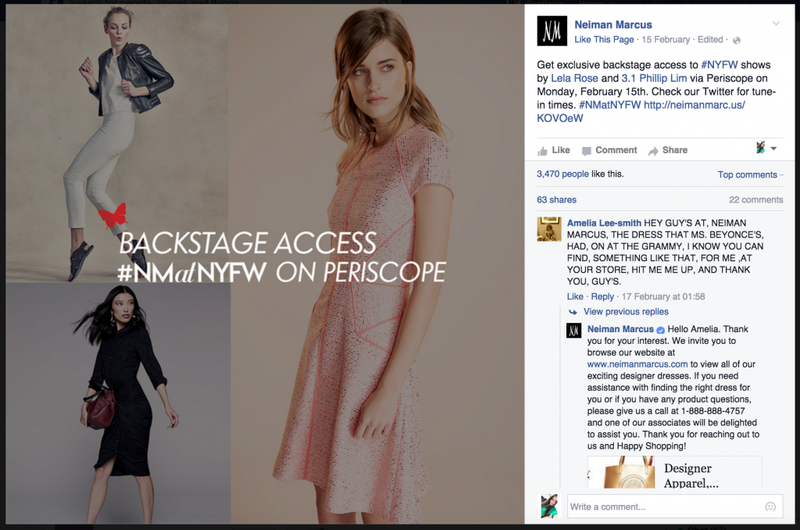 They are actively using all the latest social media tools, like Periscope and Snapchat, helping their audience to look in backstage of #NYFW. That is a good way to interact with people and generate engagement. Talking about TOP 10 performers Converse stays a Facebook leader with its 37,492657 followers. While being a leader, Converse is keep losing fans (-16,417 fans this week). Watch out, Victoria’s Secret’s coming after you. Victoria’s Secret is trying to reach Converse and being on the second position getting 11,930 new fans since last week on their Facebook page. Victoria’s Secret’s angels attract 26,915687 followers. Adidas is getting there and tread on Victoria’s secret heels with 26,661240 fans (+ 44,421 fans a week). Definitely easier wearing sneakers! On Twitter Victoria’s Secret is a leader, the same as last weeks a with 9,046442 followers in total (+ 52,151 new). These two brands Twitter fight is still ongoing. Elegance vs sport. Burberry with 5,894541 Twitter followers ( + 68,964 new) and Nike with 5,775762 followers ( +22,275 new ). 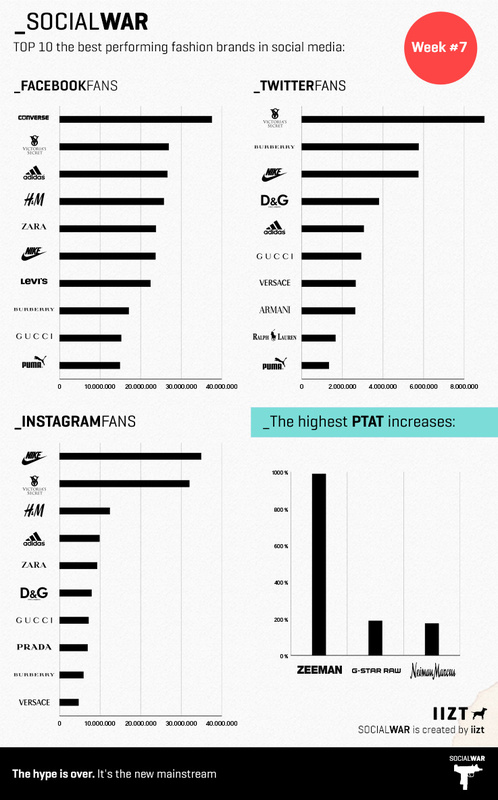 In the meantime sport is winning in Instagram and Nike is an absolute leader with 36,332951 followers. (+ 765548) new followers on Instagram last week). Nike- Just do it! Victoria’s secret is the giving Nike the leader position and having 33,009095 followers. ( +1,022380 new followers), followed by H&M with 12,533649 followers. ( +29,493 new fans). The personal favorite of Richard Derks, Instagram is a winner of Social media. A photo (or video) says more than a thousand words. How do you create a visually consistent approach of your brand in social media? Instagram lets you reflect and the mobile use confronts you with the (im)possibilities. Because Instagram is still a big unknown in Holland, so much is still possible to make you stand out. You share our passion, please call us. 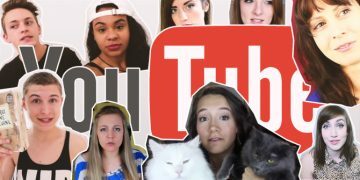 Community building according to social marketing expert Richard Derks is the foundation of a successful social media campaign. "Starting a new store or branch a retailer knows exactly which name, interior, products and target group suits him. 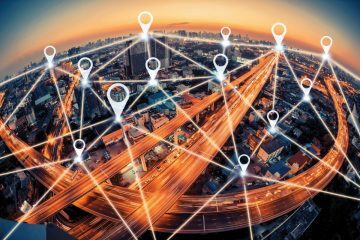 More important than the appearance of your store or the brands that you sell, however, is your community."